Male hair loss is probably one of the first things that comes to mind when we think of a hair transplant procedure, however it has also become increasingly popular amongst women experiencing hair loss. What are the causes of hair loss in women? Is hair transplantation a viable option for women experiencing hair loss? There are a variety of potential underlying causes that may lead to hair loss in women. Some possible causes of hair loss in woman are; poor diet, stress or hormonal imbalances. Hair has a significant effect on a woman’s physical appearance. For this reason when severe hair loss is experienced this condition may affect the person’s aesthetic perception as well as psychological well-being. However with the improved treatment options available today, hair transplantation can also be considered as the right choice for women. Women can also undergo hair transplant surgery if hair loss follows a pattern of receding hairline or with a concentrated thinning at the crown which is defined as androgenetic alopecia type of hair loss, also known as male-pattern baldness. Hair transplant surgery has reached a new level of excellence over the past decade and has become a more comfortable procedure for patients. During a hair transplant procedure, hair follicles are extracted from the safe donor site and are then implanted in the areas of the scalp where hair loss has occurred. A hair transplant surgery tends to frighten some women because they think that their head will be shaved However, when they undergo a hair transplant procedure, in most cases at the back of the head a harvesting surface just like a small window is created and only this area is shaved with the existing hair keeping the procedure concealed. 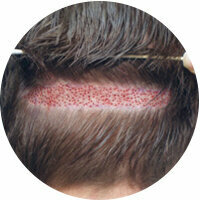 For this reason hair transplantation is also very prominent amongst women. Hair follicles are extracted utilizing the FUE method and then individually transplanted to the areas where hair loss has occured, resulting in an aesthetically pleasing appearance of transplanted hair. At the end of the hair transplant surgery session the patient can return home. Patients will visit the clinic one day after the procedure for medical dressing and will start to wash their hair on the third post-operative day. In the first week following the hair transplant procedure, it is normal to experience swelling of the forehead and redness as well as scabbing both in the donor and receipt areas. However, these symptoms usually disappear after a short time. Women are able to undergo a hair transplant procedure without shaving their head with a hair transplantation method also defined as the DHI hair transplant technique, considered as the advanced version of FUE method. The term ‘without shaving’ means that the receipt site will remain unshaved but the donor area will be partially shaved. As women wear their hair long, it is easier to perform this method. In conclusion, women can also benefit from a hair transplant surgery but it is important to diagnose the condition accurately. You can contact us at Dr. Serkan Aygın Clinic to schedule a medical examination appointment or send us your pictures so we can provide you recommendations that will seek to address your condition. As soon as you contact us our patient service representatives will provide you information on the following steps of the planning process.